The Patriots selected LB Elandon Roberts with pick 214 in the sixth round of the 2016 NFL Draft. Expectations for his role with the team were measured, as the starting linebackers last preseason (Dont’a Hightower, Jamie Collins, and Shea McLellin) were locked in. Roberts’ performance in his final year of college at the University of Houston hinted at his potential. Out of 72 draft-eligible inside linebackers, Roberts earned PFF’s ninth-highest overall grade of 84.5, and the 10th-highest run-defense grade at 80.2. 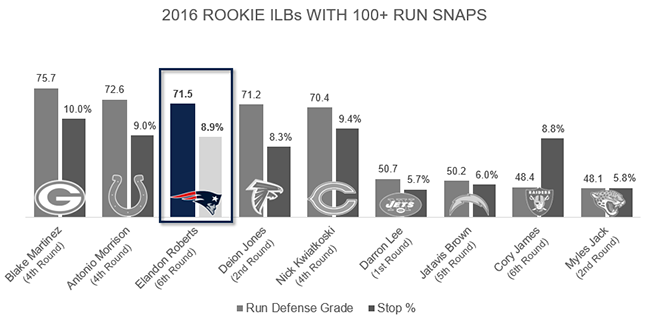 As a Patriots rookie, Roberts’ first significant action came in Week 5 against the Browns, and he burst out of the gate with 7 tackles and 5 stops. New England traded Jamie Collins during the team’s Week 9 bye, and the following week against Seattle, Roberts played 58 out of 70 total snaps. He struggled with the increased workload, posting his lowest grade of the season; after five weeks of lighter usage, Roberts earned his way back to rotational snaps from Week 16 through the Super Bowl. By season’s end, Roberts posted the fifth-highest run-defense grade (71.5) among 22 rookie linebackers, and only two rookie ILBs who had more than 100 snaps against the run graded higher; both were drafted in the fourth round. Roberts had at least one stop in every game in which he played 20-plus snaps. He had a run stop on 8.9 percent of his run snaps, fourth-highest among rookie ILBs with at least 25 percent of their team’s run snaps, and 25th out of 60 eligible ILBs overall.